How apes beat humans at certain memory tests. Are Humans Definitely Smarter Than Apes? At certain things, perhaps. But at some specific tasks, perhaps not. Excerpted from Are We Smart Enough to Know How Smart Animals Are? by Frans de Waal, to be published on April 25 by Norton. One morning, at the Dutch Zoo where I used to work, we showed chimpanzees a crate full of grapefruits. The colony was still in its night building that adjoins a grassy island, where it would spend the day. The apes were interested enough watching us carry the crate through a door onto the island. When we returned to the building with the empty crate, however, pandemonium broke out. As soon as they saw that the fruits were gone, 25 apes burst out hooting and hollering in a most festive mood, slapping one another’s backs. I have never seen animals so excited about absent food. They must have inferred that grapefruits cannot vanish, hence must have remained on the outside island onto which they would soon be released. This kind of reasoning does not fall into any simple category of associative learning, especially since it was the very first time we followed this procedure. The distress Ayumu’s photographic memory caused in the scientific community was of the same order as when, half a century ago, DNA studies revealed that humans barely differ enough from bonobos and chimpanzees to deserve their own genus. It is only for historical reasons that taxonomists have let us keep the Homo genus all to ourselves. The DNA data caused hand-wringing in anthropology departments, where until then skulls and bones had ruled supremely as the gauge of relatedness. With regard to Ayumu, it was the turn of psychology departments to be upset. Since Ayumu is now training on a much larger set of numbers, and his photographic memory is being tried on ever shorter time intervals, the limits of what he can do are as yet unknown. But this ape has already violated the dictum that, without exception, tests of intelligence ought to confirm human superiority. As voiced by American psychologist David Premack, “Humans command all cognitive abilities, and all of them are domain general, whereas animals, by contrast, command very few abilities, and all of them are adaptations restricted to a single goal or activity.” Humans, in other words, are a singular bright light in the dark intellectual firmament that is the rest of nature. Other species are conveniently swept together as “animals” or even “the animal,” as if there were no point differentiating among them. It is an us-versus-them world. Given that discontinuity is essentially a pre-evolutionary idea, let me call a spade a spade, and dub it Neo-Creationism. Neo-Creationism is not to be confused with Intelligent Design, which is merely old creationism in a new bottle. Neo-Creationism is subtler in that it accepts evolution but only half of it. Its central tenet is that we descend from the apes in body but not in mind. Without saying so explicitly, it assumes that evolution stopped at the human head. This idea remains prevalent in much of the social sciences, philosophy, and the humanities. It views our mind as so original that there is no point comparing it to other minds except to confirm its exceptional status. It loves to postulate all sorts of mental differences, even though their life expectancy has proven very low. It is born from the conviction that something major must have happened after we split off from the apes: a miraculous change in the past few million years or perhaps even more recently. Obviously, no modern scholar would dare mention a divine spark, let alone special creation, but the religious background of this position is hard to deny. The more we know about animal cognition, however, the more examples like Ayumu’s are coming to light. For example, apes solve the inaccessible peanut task better than many human children. In this task, an ape faces a peanut placed at the bottom of a vertical transparent tube. Liza, a female chimp at the Yerkes Primate Center’s field station, in Georgia, solved it right away. After some vigorous but ineffective kicking and shaking of the tube, she abruptly turned around, went to the faucet to fill her mouth, and returned to the tube to add water. She made several more trips to the faucet before she got the peanut at the right level to reach it with her fingers. Another female tried to pee into the tube! She had the right idea even though the execution was flawed. I have known Liza all her life and am sure that this problem was brand new to her. How hard this task is is clear from tests on children, many of whom never find the solution. Less than 10 percent of 4-year-olds come up with it, and only about half of the 8-year-olds. Most children frantically try to reach the prize with their fingers, then give up. In another striking example at the Kyoto institute, separate computer screens were set up for two apes. They played a competitive game that required them to anticipate one another’s moves, a bit like a rock-paper-scissors game. Could they outguess their rival based on his or her previous choices? The performance of the apes was compared with that of humans playing the same game. The chimps won, reaching optimal performance more quickly and completely than members of our own species. The scientists attributed the apes’ edge to them being quicker at predicting a rival’s moves and countermoves. This finding resonated with me, given what I know about the pre-emptive power tactics of chimpanzees. 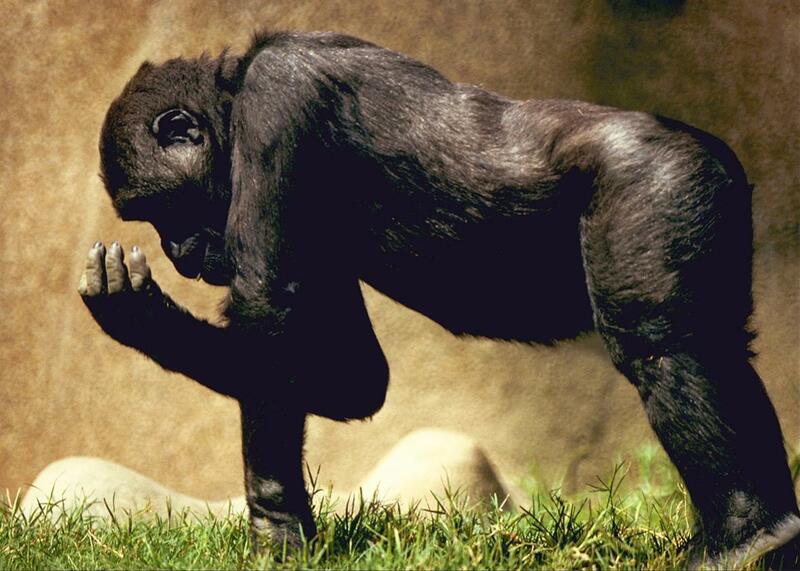 Chimp status is based on alliances, in which males support one another. Reigning alpha males protect their position by a divide-and-rule strategy—they hate it when one of their rivals cozies up to one of their supporters. I describe their Machiavellian shrewdness long ago in my book Chimpanzee Politics, which then–U.S. Speaker of the House Newt Gingrich put on the recommended reading list for freshmen congressmen. We have trouble looking at animal intelligence by itself, always asking, “Mirror, mirror on the wall, who is the smartest of them all?” Since there is only one answer that satisfies us, people watching Ayumu’s videotaped performance on the internet couldn’t believe it, saying it must be a hoax. Or they had comments such as “I can’t believe I am dumber than a chimp!” The whole experiment was taken as so offensive that American scientists felt they had to go into special training to beat the chimp. When Tetsuro Matsuzawa, the Japanese scientist who led the Ayumu project, first heard of this reaction, he put his head in his hands and said he didn’t understand the human species’ need to be superior in every way. No natural law stipulates that we are or should be. We are slowly moving toward a less anthropocentric orientation, however, with a greater appreciation of the variable lifestyles of animals. Not only has the wall between human and animal cognition begun to resemble a Swiss Gruyère full of holes, we are actively trying not to make humanity the measure of all things. We evaluate other species by what they are, and how their cognition is adapted to their specific circumstances. The mental demands on a nut-storing squirrel or an echolocating bat are so different from the demands faced by our own species that we should stop looking at mental evolution as a contest and abandon the absurd scale of the ancient Greeks, from lower to higher forms. Do we really want to compare human cognition with that of an animal with eight arms and nearly 2,000 suckers, every single one equipped with a ganglion with half a million neurons? The evolutionary tree is rather shaped like a giant bush, with branches in many different directions, allowing sophisticated tool use in crows, highly coordinated cooperation in orcas, and inferential reasoning in apes, such as their ability to draw the right conclusion from seeing an empty crate. Excerpted from Are We Smart Enough to Know How Smart Animals Are? by Frans de Waal. Copyright © 2016 by Frans de Waal. With permission of the publisher, W. W. Norton & Co. Inc. All rights reserved.